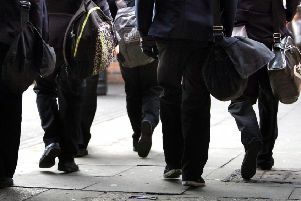 Staff will be giving up their lunch hours in protest of proposed cuts to the college which could see a number of jobs being axed. College staff are set to stage a protest during their lunch breaks over plans to axe up to 17 jobs to meet a £1.2million funding shortfall. Staff at South Tyneside College in South Shields will be using their dinner hour to show their anger over the cuts, starting from today. It was decided yesterday that we’d be protesting during our lunch breaks. The Gazette has seen an email from the University and College Union (UCU) rallying staff to take part in the gatherings, which will run between 12.15pm and 1pm until Friday. It’s understood they will be setting up camp outside the office of Lindsey Whiterod, the college’s chief executive. A source told the Gazette: “It was decided yesterday that we would be protesting during our lunch breaks. “The college is cutting costs by making lecturing staff redundant, or down grading their posts – yet they are about to appoint another vice-principal on a wage of approximately £55,000. The UCU says that the cutbacks – which have been proposed after the college’s further education budget was slashed by £1.2million – could see 14 lecturers, two members of management and a member of clerical staff made redundant. The swathe of cutbacks could also include increases in teaching hours, cuts to benefits, such as occupational sick pay and maternity pay, and reductions in redundancy payments.